The Common Technical Document (CTD) replaced the Notice to Applicants (NtA) for the submission of licence applications. This became mandatory in Europe in 2006, in 2005 the CTD format was adopted by the US, there was a requirement for Japan to do this in 2008, and a move in 2007/2008 for the rest of the world. This followed review by the International Conference for Harmonisation (ICH) to produce one document acceptable by the Food and Drugs Administration (FDA) in the USA, the European Medicines Agency (EMA), and the Japanese Pharmaceuticals and Medical Devices Agency (PMDA). Since January 2010 it is now mandatory for all submissions to be made in electronic CTD or eCTD format. 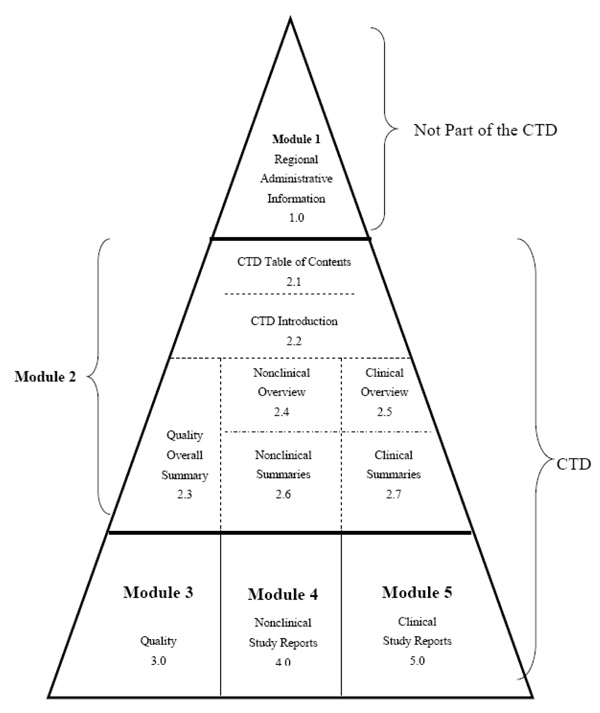 Module 1 – is not part of the CTD. This is not defined by the ICH guidelines, and contains specific regional administrative information such as application forms. Module 2 – provides an introduction to the pharmaceutical drug and includes key summaries of the submission data, for example the quality overall summary, non-clinical overview and clinical overview. Module 3 – contains the quality information for the drug substance, drug product and any relevant regional information. Module 3 is also referred to as the Chemistry, Manufacturing and Controls (CMC) section. Module 4 – contains safety information presented in non-clinical study reports. Module 5 – contains efficacy information presented in the clinical study reports. For older NtA dossiers any changes to the registered details must be filed in eCTD format to the relevant, often national, Regulatory Authority as they are still subject to regulatory controls for maintenance under Change Control. Companies can manage this by converting the relevant sections of the NtA to eCTD format, or by converting the whole dossier. Whilst converting dossiers from NtA to CTD format, companies often assess the quality and relevance of the registered information and to ensure alignment and avoidance of Registration Drift. Woodley BioReg supports clients in NtA to CTD dossier conversion; this can be an onerous and resource-consuming task, so WBR provide Flexible Remote Resourcing Solutions allowing clients to access resources as and when they need it. Woodley BioReg work closely with our eCTD software provider (LORENZ) and have developed a robust and efficient method to support “mass dossier conversions” from NtA (and other formats) to eCTD. Our process involves extraction from often poor quality photocopies or PDFs of NtA dossiers, and conversion to high quality eCTD submission-ready components. To add value to this service WBR performs Conformance assessments against plant, manufacturing, testing, and release procedures and Compliance against cGMP during the conversion process. For more information on NTA to CTD please contact us.